Los Angeles County Sheriff’s Department Homicide detectives are continuing to assist Bell Gardens Police Department personnel investigate the shooting death of a Hispanic man that occurred in the 6800 block of Adamson Avenue, Bell Gardens, on Monday, January 29, 2018, at approximately 4:48 p.m.
Bell Gardens officers were dispatched to the location in response to a “Shots fired, one person down” call. When Homicide detectives arrived they observed the victim, who was pronounced dead at the scene, had sustained at least one gunshot to the torso. Upon initial investigation detectives learned the victim was talking with an unknown man in the driveway of the location, when gunshots were heard. The suspect described only as a male (no further details available) was seen running westbound on Lubec Street and out of view. The motive for the shooting remains unknown, and the investigation continues. The victim’s name is not being released, pending next of kin notification. 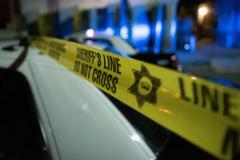 Los Angeles County Sheriff’s Homicide detectives are responding to the 6800 block of Adamson Avenue, Bell Gardens, to assist Bell Gardens Police Department personnel investigate the circumstances surrounding the shooting death of a man.